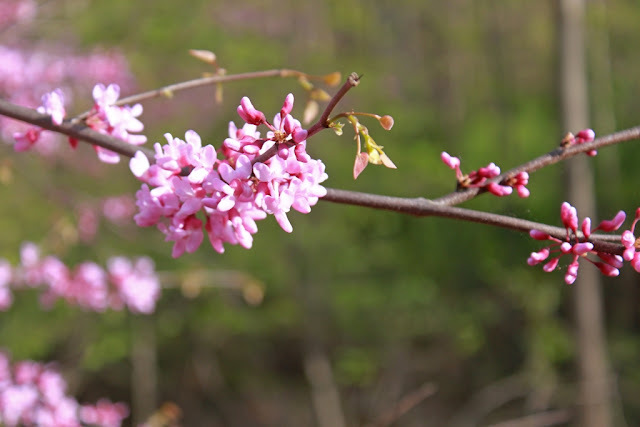 In addition to the redbuds, assorted other spring activities are taking place around the cabin. Wild turkeys are more common than deer at the moment. I hear the toms gobbling every morning, and hardly a day goes by that I don’t see turkeys parading in some field or another. Turkeys fly across the road in front of me, and people who’ve never seen a wild turkey before are seeing them this week. Several summer residents have appeared as well. I’ve heard the first eastern towhees of the season and seen the first brown thrasher. A few warblers are trickling through, but never yet when I’ve had binoculars in hand. My photo today shows the fuzzy trees of spring. Fuzzy is how I think of them as they are starting to leaf out. The photo was taken on Sunday, as it’s been raining, foggy and overcast since then. I’m not complaining about that. April hasn’t brought many showers this year, and the year’s precipitation is already running more than two inches in arrears. The drizzle of the past two days won’t erase that, but at least it’s helping a little bit. Rue anemone must be at its peak of blooming right now. The forest floor is covered with the tiny white flowers around my cabin. It’s a very good year for them, at least if the numbers I’m seeing are any indication. I’m still waiting for the local geese to hatch their clutches of goslings. So far I haven’t seen any of those, and the females are still hugging their nests. 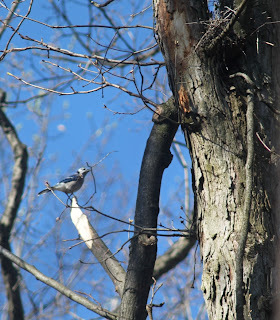 The female blue jay is also on her ratty nest of twigs and sticks full-time. She hasn’t been on the nest for more than a week yet, so she’s barely halfway through incubating her eggs. I am guessing that they will be due to hatch about May 9 or 10. The goslings should be out before that, likely within the next week. Redbud is at its peak this week. Although it looks like a flower, the pink is actually the leaf bud. And when the leaves are fully out, the tree is green like any other tree and not very attractive. It’s a spindly, weak and unhealthy-looking tree. That same spindliness is attractive when the tree is in its pink phase, but not very for the rest of the year. Redbud also prefer the edges of the forest and are inclined to grow in poor soil where nothing much else is happy. I’ve often wondered how many trees are cut down simply because people are culling weeds and “improving” the edges of their property and don’t realize that the spindly, unhealthy-looking tree they just cut down shows beautiful color for a week or two in spring. The spindliness makes for interesting shapes when the twiggy branches are covered with pink buds. Unfortunately, the rest of the time the tree just looks spindly. 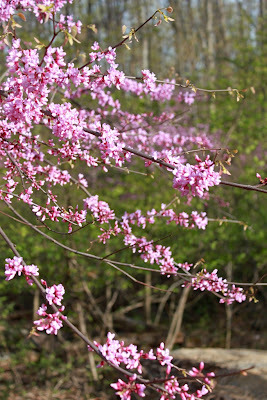 I found it difficult to photograph a redbud among the rest of the forest trees. The rest of the photo always contained water pipes or other detritus from Roundtop. If there was junk around, there was a redbud behind it. The tree just prefers spots that other trees won’t grow in. This morning I heard three calling eastern phoebes while standing in one spot. One to the right of me, one to the left and the third overhead. They seemed to be engaged in a round robin (pun intended) of “fee-bee”ing to see which could out “fee-bee” the others. The blue jay nest that I found last week appears to be finished and doesn’t look any better than the mass of sticks it was when it was still a work in progress. This morning, mom blue jay was on the nest—I could see her tail feathers sticking out of it. As the nest is high, I can’t tell if she was intent on laying an egg or already incubating her clutch. Yesterday, one small and unknown warbler was flitting around on the other side of the lane. As I was letting the dogs out after returning home from work, I did not have my binoculars in hand. Dogs and binoculars do not go well together, so the warbler remains unknown. 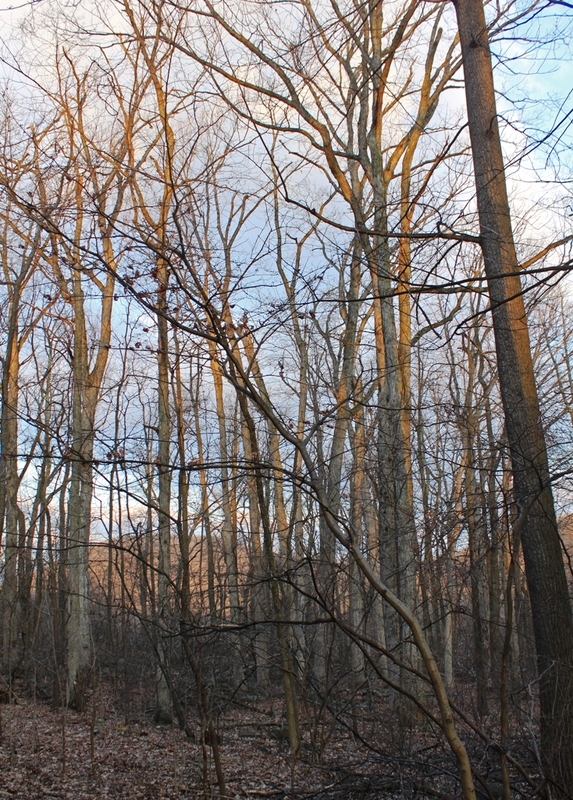 My photo today is of one of the three large American beech trees in my front forest. This one could be a bit larger than the other two, but all are very nearly the same size. I can’t photograph the entire tree in one photo because whenever I back up far enough to get all of it in the same shot, the other trees around it begin to obscure it. It is a lovely and venerable beech tree, with small sapling beeches all around it. Most of those won’t survive, as they can’t compete with this large tree for light. Those little trees won’t get their chance until this large tree has had its century or two and no longer dominates. The tree is more than twice the height of the cabin and way too big for me to circle the trunk with my arms. It’s always been my favorite tree at the cabin, rising straight and tall, past the tulip poplars and even some of the oak trees. I’m sure it’s more than 100 years old and is easily going on 3 feet in diameter. Someday I should measure its trunk so I can tell you exactly how big it is. But that’s a topic for another day. Of course, here on Roundtop, thunderstorms are marching across Pennsylvania, so it’s unlike my sky will be clear enough to look. That tends to be the rule rather than exception on the few nights of the year when the aurora borealis is likely this far south. Around the cabin new growth, new blooms appear every day. Last night I saw the first poison ivy along the edge of my lane and the driveway. I keep hoping, to no avail obviously, that the forest canopy will soon make it too shady for these plants. But, of course, the cut for the driveway and the lane lets in the sunlight and so up jumps the poison ivy. The fern in today’s photo has grown in the crack of this boulder for years now. It is starting to feel like an old friend, and I look for it whenever I pass. It is not on my land, and indeed is right along the edge of the lane. Even a minimal widening of the road would displace it. Its long-tern survival is thus rather precarious, but every time it lives to see another spring feels like a small victory. The fern never gets bigger and is always in the same part of the boulder’s crack. It is a survivor against all odds. It’s one of those things I try to enjoy when I see it and try not to look too far ahead into its future. Some days that’s easier than others. For some reason, the ferns that grow profusely just 150 yards away are near-strangers to my part of the mountain. Where I am is drier, I suspect, and the soil probably less rich. Still, the divide between the ferny part of the mountain and the non-ferny part is nearly complete, so I welcome this little one to my part of the mountain. I only wish there were more around the cabin, though I will be the first to tell you that it isn’t much of a walk to enjoy several varieties of ferns in large numbers. 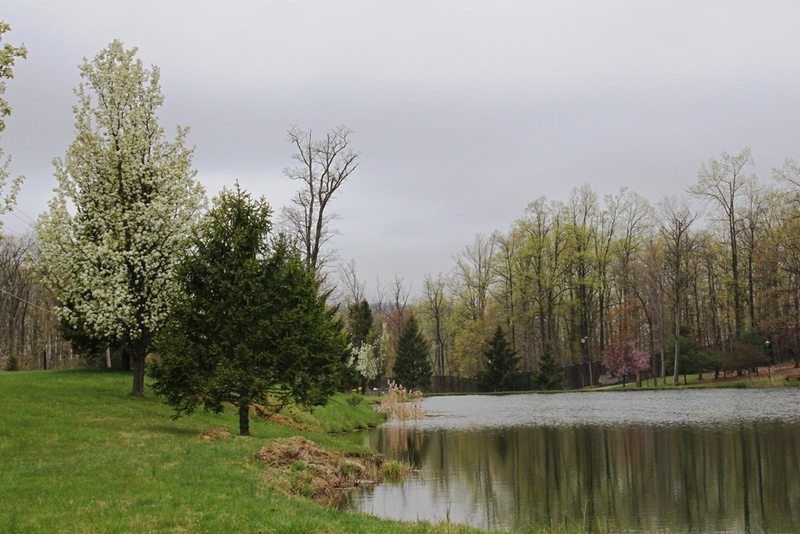 The landscape is opening up to the spring season here on Roundtop this week. The redbud are starting to turn pink, though are still not near their peak of color. The dogwood really aren’t ready to bloom at all just yet. The grass has turned from a greenish brown to a brownish green and now finally fully to green. The geese are incubating clutches of large, white eggs on ponds all around the mountain, each pair to its own pond, with assorted honking battles for prime territory still sounding off most evenings. The American beech trees have miniature leaves at their edges. The old oaks are nearly as bare as during midwinter. Nothing hurries them. They will leaf out when they are good and ready. 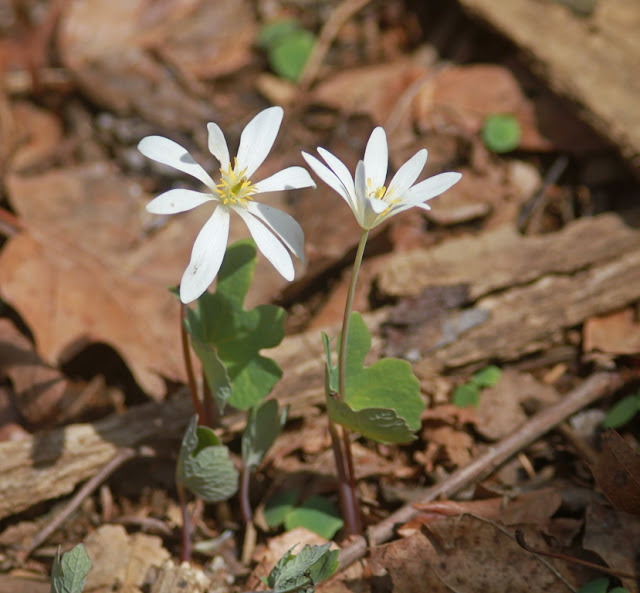 Blooms of rue anemone dots the forest floor, and the mayapples will soon flower. Swallows have returned to ply the ponds for insects. The dawn chorus of singing birds grows louder by the day. Spring is well and truly here and well settled in, as well. This is to be expected as we are already a month into the astronomical season, a full month past the vernal equinox. Here, April will likely end up being warmer than normal, due mostly to three days that were profoundly warmer—by 20 degrees!—than is typical. The rest of the month has fared in the normal range, even cooler than is typical, but those three warm days simply overpowered the rest of the month. As you can see, the sky is overcast in the photo taken this morning. I’ve had some clear days, but overcast has been more the norm than the exception. Though I am more than 100 miles from the ocean, today’s overcast is the result of an east wind, bringing in a marine layer of clouds. And there’s been rain during the month but not enough to make up a 2 in. deficit. I think of a typical April as one with many April showers. I remember some Aprils as a constant drizzle. That has not been the case this year, though I’m not sure I like the overcast skies much better. Last year May was the month of showers, not April. As rain has not much materialized this month, I am rather hoping that they will come in May. It’s not that I like a usually pleasant month like May to be clouded by rain, but if we don’t get a hefty amount of it in May, it’s likely to be a long, hot and dry summer. And I’d like that even less than rain in May. Every day should be Earth Day. That said, if there’s any day to make an effort to get outside and observe the natural world around you, today should be that day. I celebrated early, as in yesterday, because of the weekend. I packed up my binoculars and my scope, took a few snacks and a cup of coffee and went outside to see if I could find any migrating hawks. Earlier in the week I had some hope that Sunday might turn out to be a good migration day. 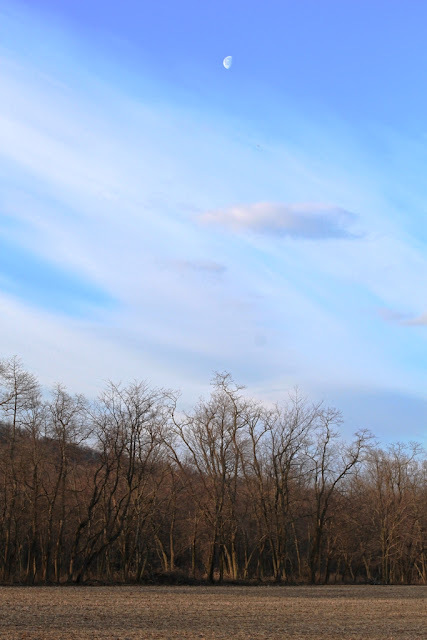 By the time the day rolled around, however, the calm winds turned into a 17 mph wind and worse, that wind was from the ENE, certainly near the very bottom of the worst possible directions for a spring hawk count. But I went anyway. Early in the day I did see a few hardy migrants, likely birds that roosted in or around Roundtop before continuing their northward journey. An Osprey was perched atop a zip line pole, waiting for fish. One of the local redtails soon appeared, looking for breakfast. A Cooper’s hawk zoomed by, intent on some prey in the cover of the forest. The first barn swallows put in an appearance and a few more tree swallows were added to my season total. The crows were riled up about something, as were the blue jays. A light frost had occurred overnight, and the wind made the temperature feel just this side of brutal. I stayed until my gloved hands started feeling numb. By then, the early morning rush of birds had slowed, and I was ready for a cup of hot chocolate! This must be flower week for Roundtop. The spring ephemerals are popping up all over the forest. Today’s flower is rue anemone, which has gone from just a few blooms to dozens, if not hundreds of them, all around the mountain. These are small plants, no more than 4-5 inches tall, and if you are not careful, you can easily step on them. This was a nice little bunch of them. Often, only a single flower is seen or perhaps two. Sometimes I come across a small patch of them, where I will find 6-8 blooms scattered in an area of perhaps 5 ft. x 3 ft. Even then they are not always easy to spot. Other than the small flowers on the forest floor, the overall view around the forest as a whole does not look particularly spring-like. Some trees have buds that look suspiciously large, but many are still as bare as winter. The other evening I walked deep into the forest and sat for a while, enjoying the warm weather. Wind through the trees made the most sound. A few crows called in the distance and one pileated woodpecker, but that was all. The chorus of woodland birds was silent, so I listened to the wind and enjoyed the view from my perch on a conveniently-located boulder. In a few short weeks, the forest will be so lush that I won’t be able to see very far. But last evening, from my boulder along the edge of the mountain’s side, I could see both above the forest canopy and the forest floor below me, the ground rolling away to bottom out along Beaver Creek. That expansive view won’t last much longer, so I wanted to enjoy it one last time or perhaps the next to last time before the vegetation hides it until late fall. 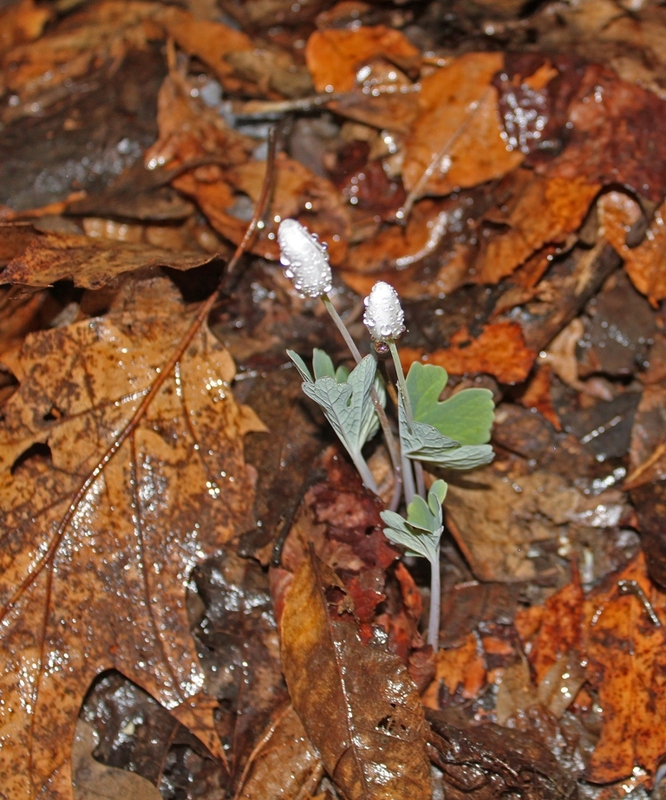 For the moment, the forest spring is best seen in the small and up-close plants that are pushing through the detritus of last fall’s leaves. The large plants of the forest still have a ways to go before they reflect much of the new season. On last evening’s walk I ambled over to the new pond at Roundtop, using the high bank as a vantage point to scan the western horizon for late migrating raptors. So I was suddenly startled by the sound of a goose immediately behind me, spooking almost from under my feet and into the pond. When I turned around and looked, I found out why. She was on a nest of 6 or 7 eggs, located at the edge of the walkway to the pond’s stand pipe. No doubt she was hoping I would not notice her (and I didn’t), but eventually I got too close for her and she bolted. She didn’t go far, though, as you can see her floating worriedly in the background. I snapped one quick photo and went on my way. Gone again for another year. I had 10-12 of the little blooms at the edge of my forest. Unlike the dog-toothed violets that may bloom successively over a week or so, all the bloodroot flowers bloom on the same day. This year, heavy rain on Saturday knocked down a few of the buds, so I ended up with fewer blooms on Sunday than I might have. Life is tough on these little flowers. Gone already, the petals drop one by one and then the flower heads go to seed immediately. It seems kind of sad to me, such a short time in the sun—all that effort for one little day. A short time blooming and a long time gone. And who knows what the next year will bring? The spot where these blooms appear is a small one, a strip of earth perhaps 6 feet long and no more than 2 feet wide. Some year, after I’ve gone, if someone widens the car parking spot by even a foot, they will be gone. As it is, I have to take care not to back the car too wide and overshoot my parking area. I came within 6 inches of crushing one plant when I backed into the spot earlier this week. I often wonder how frequently such things we humans carelessly and mindlessly destroy. Someone builds a new house and never learns what grew there before the house was built. Perhaps it was a tree where pileated woodpeckers had nested for years. Perhaps it was a patch of lady slippers. For all I know when my cabin was built 40 years ago, perhaps all but a few bloodroot, those few that now hang on next to my car park, were destroyed. It’s a sobering thought that we know so little about the land’s inhabitants, both flora and fauna, before we destroy the landscape to build something we think is important. Sometimes I wish that we’d consider the lives that lived before we came onto the land a little more. Do we really need a 4000 sq. ft. house when a 1000 sq. ft house would do (and save more of the land)? Could we simply change the location of our driveway to protect that patch of lady slippers? Of course, that would mean knowing our land before we build on it. I wish that wasn’t too much to ask. 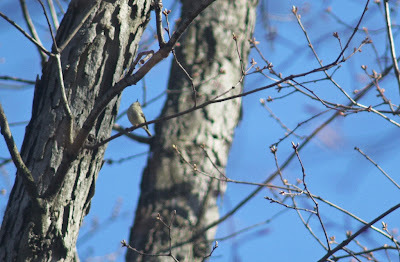 The ruby-crowned kinglets were flitting through the very highest of the trees, so my photos don’t show close views. I also took a lot of photos when I looked at them later that turned out to have no ruby-crowned kinglet in them. The birds flitted away between the time I saw them and the time the shutter clicked. That’s how fast they are. In the second photo of the kinglets, the little guy looks to be singing his heart out, beak pointed at the sky, his head thrust back, giving it all he’s worth. 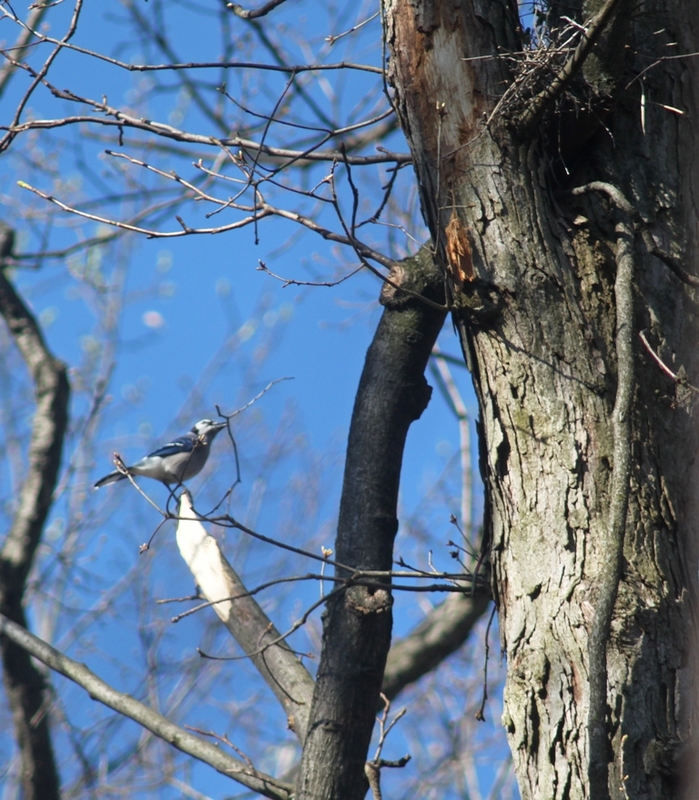 ﻿﻿The blue jay holds a twig in her beak and the nest is up in the crook of the tree above her. It’s the scroungy looking pile of twigs in the crook. I hope the bird will make that nest look a little more secure by the time the nest is done. Right now it doesn’t look as though it will hold an egg inside it. Of course, it is a work in progress, so there’s still time to fix it. Buds on the oaks and beech trees that make up most of my forest are starting to look bigger, though they are still weeks away from leafing out. For once, the first in several years, the timing of spring is at least close to normal. Likely the colder March had a lot to do with that. 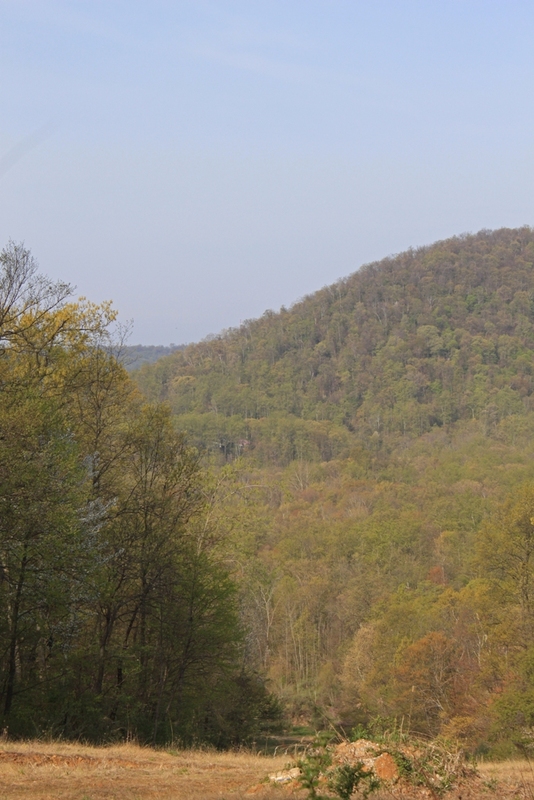 As a result I’m anticipating a decent spring for warblers here on Roundtop, hopeful that they won’t fly past the mountain without stopping first. So far, I don’t know if I’m right or not, but it’s certainly time to start looking for them. I took both these photos around 7:30 this morning, about two hours after the rain started. The bloodroot leaves were just poking through the hard, dry ground last evening when I got home. This plant is very nearly a one-day wonder. Its pretty, daisy-like but vaguely waxy flowers don’t last much longer than that. The flowers won’t open in today’s rain, though. Tomorrow, when the rain clears, they will open and will almost certainly be dropping their petals by Sunday evening. And then the flowers will be done for another year. If I didn’t have this flower at the edge of my driveway, I’d probably miss seeing them most years. They come and go so quickly that unless they are underfoot, as these very nearly are, it’s easy to forget when you can find them or perhaps they come out a day or so earlier or later than you expected and that’s all it takes to miss them entirely. 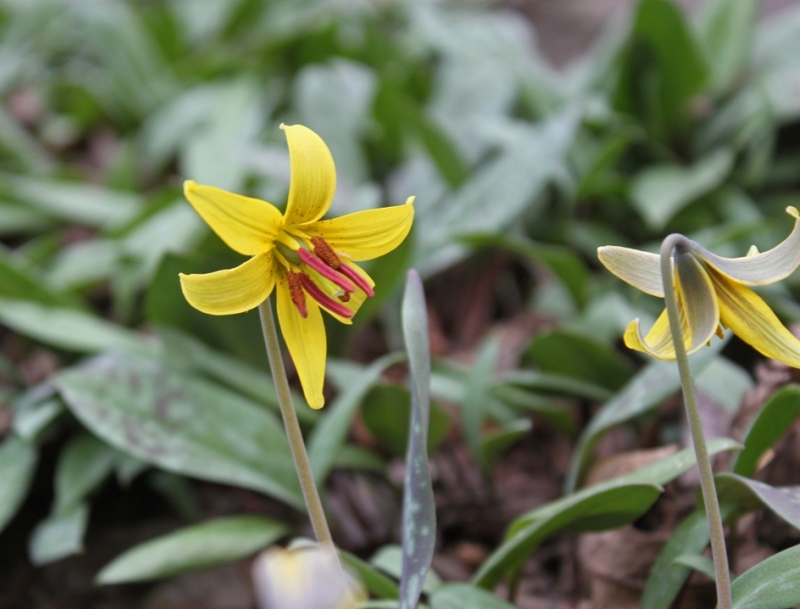 Fortunately for me, they are right next to the yellow-toothed violets that bloomed yesterday, so I don’t miss them. 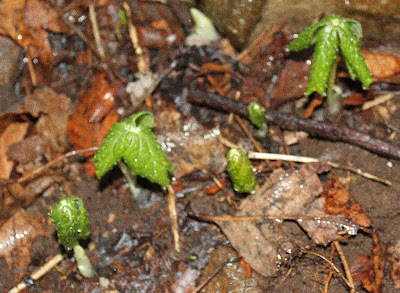 The mayapples are now out of the ground by an inch or two. They were not up at all yesterday afternoon. But this morning, barely two hours after the rain began, they were already poking up through the ground. I knew the first rain would bring an explosion of new growth. But I didn’t expect it to happen quite this fast. I thought it would take a day or two, not a couple of hours. But here they are, the new plants of spring, bursting out of the ground and ready to take on the season. I didn’t expect the dog-toothed violets would bloom so quickly. Yesterday morning the bloom stalks were closed tight, but by evening I had 9 blooms in my violet patch. I thought it would take a few more days for the blooms to open. I counted a total of 14 bloom stalks, though some hadn't opened yet. That sounds like a lot, except this patch is dense with leaves and measures about 5 feet by 3 feet. All told, I would guess there are a few hundred leaves in that patch, which is just three steps off my front porch. With that many leaves wouldn’t you expect 50 or so blooms? I never have anywhere near that many, and 14 blooms stalks at once is actually a rather high number for this patch. After this initial burst of blooms is done, I will get another few blooms cropping up here and there over the next week or so but not very many more. The first day of blooming always is the most blooms at once, too. For the record, the blooms are appearing at the typical time, considering that I’ve only recorded the day of their appearance over the past six years of writing this blog. The earliest appearance was last year on March 20 after the non-winter; that was a good three weeks ahead of schedule. The latest I’ve recorded was April 25 in 2007. That was a year when 12-13 inches of snow fell in mid-March, after a winter with a lot of snow cover, and that last snow stayed on the ground until nearly the end of the month. Other dates for the blooms were April 8, 12 and 14, to which I now add this year’s April 10. Spring’s arrival here on Roundtop is still mostly a subtle one. I can find a few tiny leaves poking up through the dry ground. All are still unrecognizable. Those who grow flowers or vegetables from seed know the kind of leaves I mean. It is those first, tiny little round leaves that pretty much look the same on every plant. Perhaps a sixteenth of an inch across, it’s at this point that you’d better hope you have marked what each flower or seedling is because you sure won’t be able to tell from those two tiny little leaves. A few things I can recognize—the leaves of the dog-toothed violet are well up, and the first bloom stalks are rising above the leaves. The buds on the stalks are still tightly closed, so I expect it will be a few days before the yellow blooms appear. The rest of the forest still looks like winter after the leaves drop but before the snow falls. Today is much warmer than is typical, ahead of a storm that will drive the temperatures back down into the April range. Assuming I get some rain from the oncoming storm, the forest will likely look much different, possibly within hours after that storm passes. Spring will appear and plants will pop up literally overnight as if from nowhere. Sometimes the change is so fast it’s as though I’ve time-traveled forward or moved to a different place that still has the same trees. The change can be that dramatic and that overwhelming. That doesn’t happen so dramatically every year, but it certainly happens every couple of years like that. Will this year be one of those? I’ll just have to wait and see. Regular readers of Roundtop Ruminations (how’s that for alliteration?) may remember that late last fall I chose a piece of ground in my forest to study in some depth. I always feel as though I’m missing important nuances around me. The forest has much more to show me and teach me than what I notice on any given day. I wanted to start to delve more deeply into that forest knowledge, which is why I came up with the idea of studying a (much) smaller piece of ground. The entire mountain is far too large an area to study in any detail, so I arbitrarily chose a rather non-descript spot in front of my cabin to look at for some of those small details. The spot has the advantage of being close, so I can look at it every day for as long as I care to or am able to. I wrote about that here and here. One thing I've discovered since fall is that winter’s short hours of daylight hampered my investigation to some extent. And in a way, snow didn’t help either, as I was looking at snow and not at the patch itself. Both those issues are solved with the coming of spring, so I am now able to devote the kind of attention to my spot that caused difficulty over the winter. And that’s where today’s photo is from. 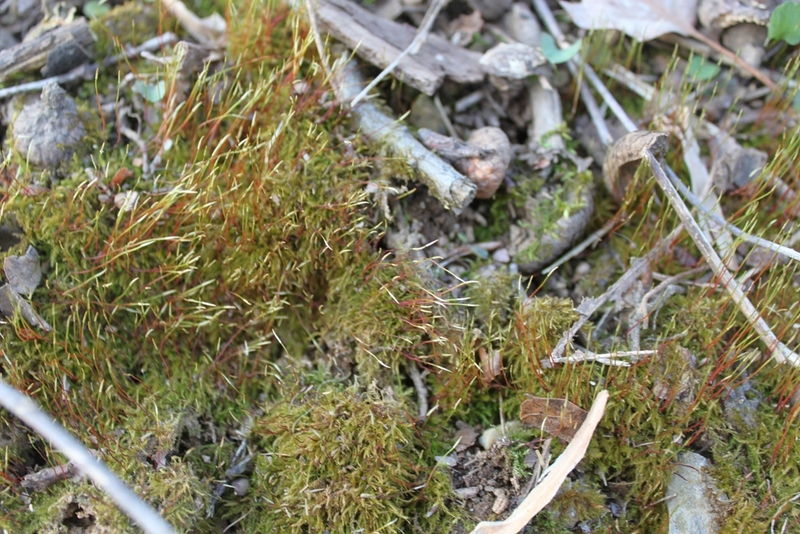 It’s a small patch of moss on the edge of my patch, which is roughly 5 feet by 4 feet. So far this spring, the moss isn’t yet very green. In fact, everywhere around me, the mountain isn’t yet very green. The best I can say is that grass and moss is kind of a greenish brown this week, but brown still predominates. Today, I was looking at the moss and noticing the stemmed capsules that protrude above it. This moss is an acrocarp, and those capsules are the fertile part of the moss, how it spreads and regenerates. What this tells me is that the moss has already noticed that it’s spring and is acting accordingly. 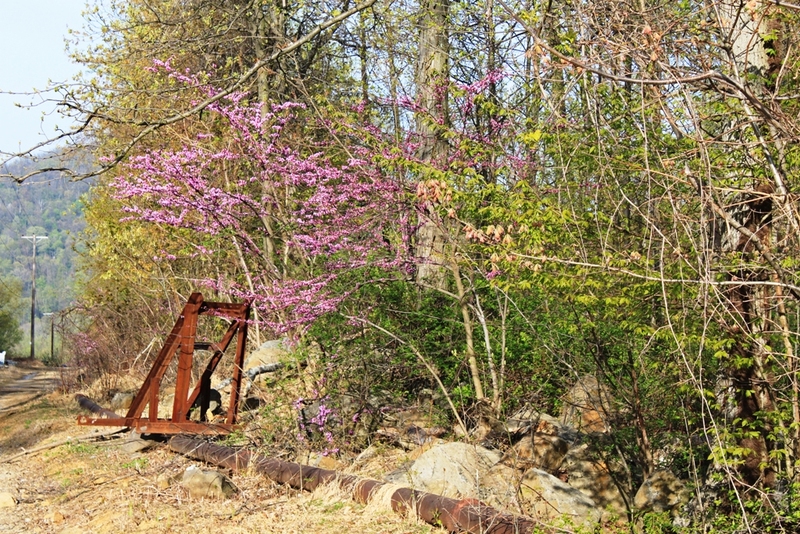 So even though when I look across the forest as a whole, it doesn’t look much different than it did in December, but on a smaller and closer level, spring is here. You just have to look at it pretty closely to see it. See? Already my little patch is showing me things that aren't immediately apparent. In a small way, that's what I hoped would happen and will continue to happen throughout this year. Coltsfoot is up! 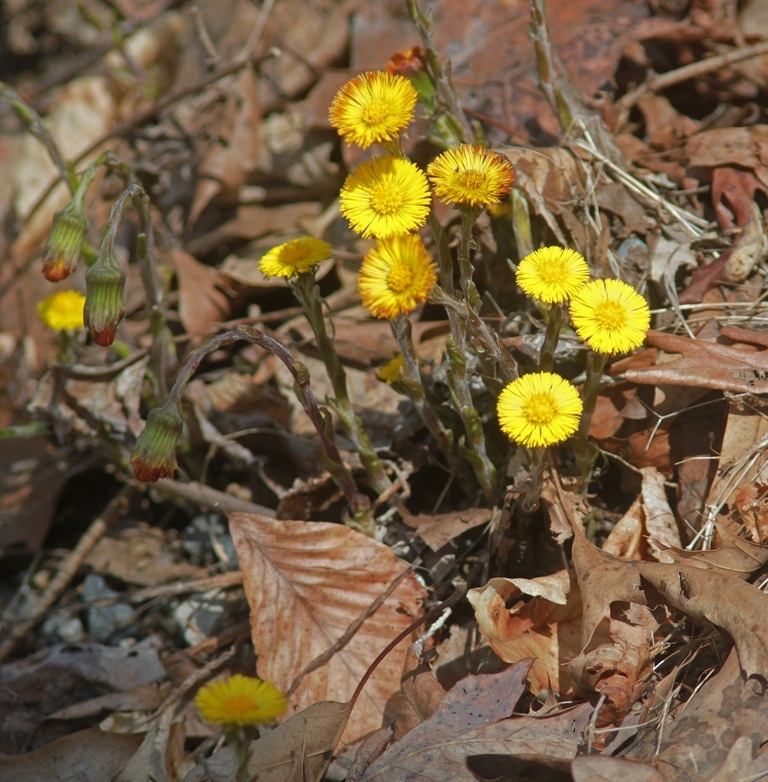 This little dandelion lookalike without the leaves is always the first bloom of spring and quite often the first anything above the ground here on Roundtop. I found this bloom on Sunday, the first warm day that stayed in the ‘60s for more than a minute and a half. Timing of the arrival of this plant isn’t unusual. My blog tags show other blooming days of April 5 and April 7. I had a few late blooming days of April 20 and April 18, too, so overall the timing is quite typical. 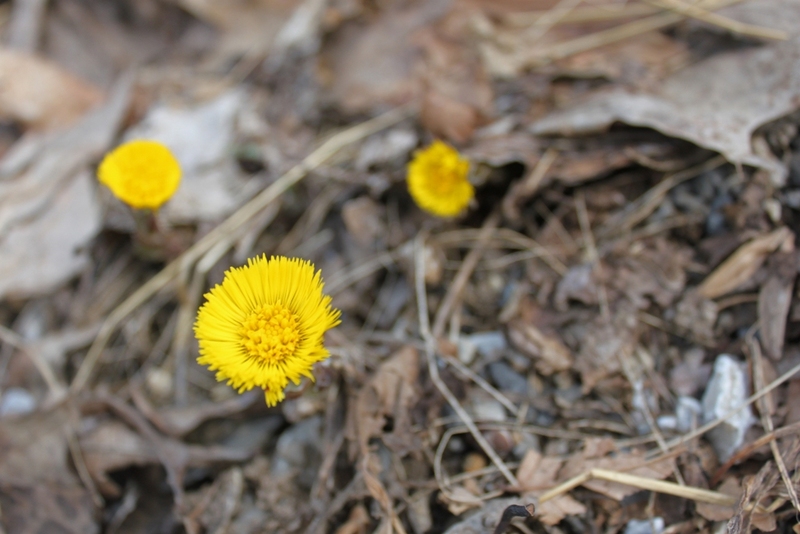 Coltsfoot is from the aster family, which isn’t a surprise when you see the flower. The leaves don’t appear until after the bloom is done. The plant used to be used to make teas but was found in more modern times to cause severe liver problems, especially in infants and even when the mother drank the tea and not the child. So the plant has no good use except to announce the arrival of spring before anything else does. Around the cabin, phoebes are singing on territory now and not just passing through on their trips further north. Yesterday I let the chickens run loose, though I checked on them frequently. Doodle my rooster alarmed every time a crow flew past, let alone a turkey vulture, and I would go outside to check that their alarms weren’t caused by something more predatory. Every time I went outside, from morning to evening, a phoebe was singing away. Hawkwatches around the Great Lakes reported a good day yesterday, too. A nice southwesterly breeze gave migrants a nice tail wind to aid their flights. I am still waiting for and hoping for the first small migrants, such as blue-gray gnatcatcher or perhaps a yellow-rumped warbler. So far that hasn’t happened, but they will be moving north too and it’s likely this week will see the first arrivals of those. Spring is underway, if not yet reaching the explosive point. That will come soon enough. Spring is still stuck in neutral for the next day or so. 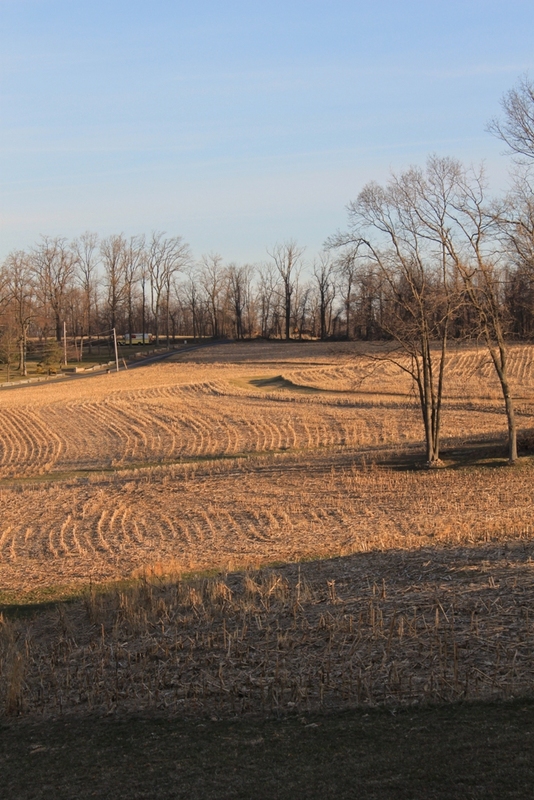 A warm up, enough to move the season along and push new growth out of the ground, is but a few days away. But that promise, that hint of warmer weather wasn’t enough to keep from setting a record low last night. So for the moment, spring remains a promise and not a reality. I am anxious for something different to look at. Early spring is a good time to do some outside cleanup around the cabin. 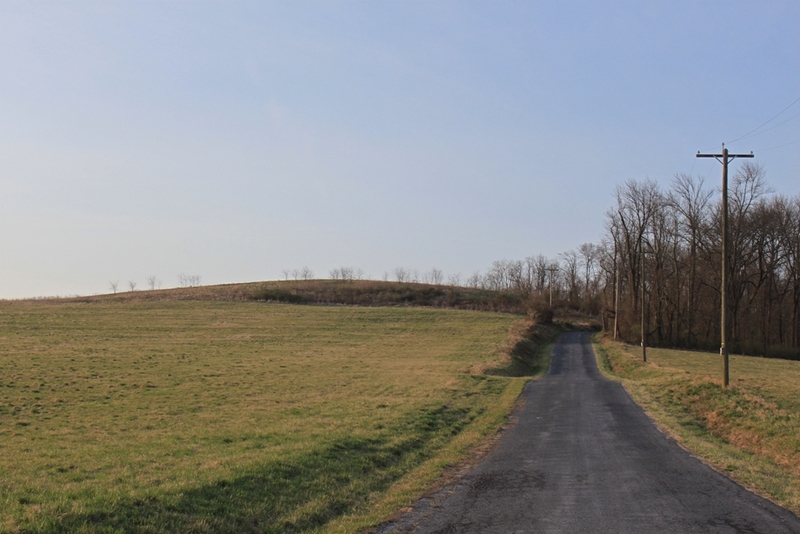 It’s not yet too hot, and the lack of greenery and underbrush makes the clean-up easier. I have a lot of downed limbs, in addition to the usual array of pots broken by winter’s freeze and thaw cycle or plastic flower pots that were broken when they were covered by snow and I stepped on them. Last night I also discovered that an old wooden deck table that came with the cabin finally lost a leg and now sits at an angle at the edge of the property. So there is work to be done, though I don’t seem to have much ambition to get to it. Perhaps there will be time this weekend, when it is sunny and the temperature rises a few more degrees each day. Work is easy to ignore when daylight lasts longer, and a walk after work in the woods is far more fun. The woods are at one of their less interesting points in the year, too, but walking in daylight still feels like a novelty to me, even if the scenery is less than stellar. Last evening I heard one of the local wild turkeys gobbling away just at dusk, perhaps calling his harem to roost, perhaps searching for hens to create a harem. It is a wild and crazy sound, not as evocative as a loon’s call or a red-tailed hawk’s scream but not far from that either. It was the first one I’d heard since winter broke and marks yet another sign of the spring that hasn’t quite arrived yet. After a mostly gloomy and overcast winter, the clear skies of this April are very welcome. Yesterday I wrote about how beautiful the morning light is, and last night I enjoyed the nighttime sky every bit as much. With skiing at Roundtop closed for the season and clear skies overhead, the stars are brilliant right now. I keep hoping to see northern lights—Alaska has been treated to some spectacular shows this year—but I’ve yet to see them this year. In fact it’s probably been ten years since I’ve seen a display here, at least in part because of cloudy skies on the few nights when I might have been able to see them. Northern lights, or aurora borealis if you prefer, are often associated with both the spring and fall equinoxes. That’s because geomagnetic storms, or disturbances in the earth’s magnetic field, are strongest then. In addition to the spring and fall timing, several additional things during these times also signal when might be a good time to look for the lights. 1. Disrupted radio communications, such as with CB radios. These disruptions are often reported on local media, too. If you hear about those, that night and the next night are good times to check. Green lights are the most common kind. Once I saw a big red “pom-pom” of northern lights here at the cabin. I clearly remember walking around the mountain in the early evening and having a sense that the air was crackling with electricity. I even saw a red light before the sky was fully dark that day. Northern lights are seen in the northern sky, of course, here in the northern hemisphere. Usually, the glow from them is subtle this far south, but sometimes they move, which only makes the display more amazing. Cornell University created something called the “K-index” to describe how far south an aurora might travel based on geomagnetic activity. When the K factor gets to a 7, we have a good chance to see auroras in southern PA. You need a K factor of 9 to see auroras in the southern U.S. but a K factor of 2-3 is good enough if you happen to be in Alaska. Spaceweather.com is the site I use to check on the likelihood of auroras down here. They also have a good explanation of auroras and the k-index, too. Right now the k-factor is low at a 1, with a 2 predicted for tomorrow. In fact the sun hasn’t produced a flare for nearly two weeks now. I’m hoping that means the next one, whenever it comes, will be strong enough to send auroras down here. But if not, well, the sky is still gorgeous right now and the stars shine like laserbeams in the black night. April has such a nice morning light. The month falls on the opposite side of our yearly orbit of the sun from October, so perhaps the lovely light shouldn’t be so surprising. October, of course, has gorgeous leaf color to enhance the golden color created by the sun’s angle, so April is at a disadvantage there. And while October’s light seems prettiest to me in the late afternoon, in April I think the morning light is nicest. The forest here at Roundtop is still sleeping, at least on the outside. I suspect that underneath the ground plants are stirring and getting ready to push up and will only need a little encouragement from the next warm day. That warm day isn’t due here yet for another day or two so. Until then the light itself is the star, with no competition from October’s golden leaves or the first shoots out of the ground. That golden light is enough. Enough to stop me in my tracks as I hurry to finish feeding the chickens. I stand, bucket in hand, and watch the shade deepen and brighten over the mountains to the west, a kind of alpenglow of the Appalachians, or appalachianglow. 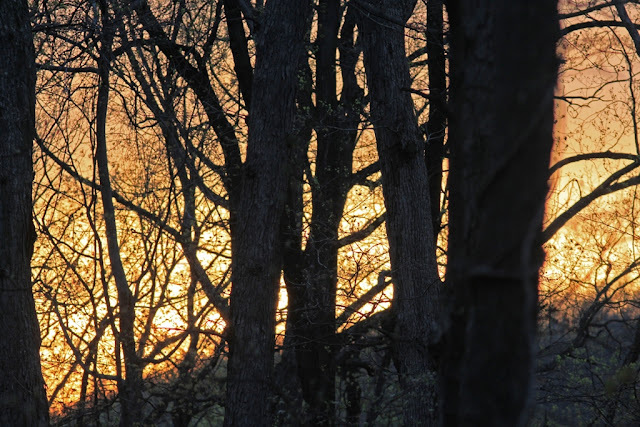 The rising sun strikes the upper reaches of the trees first, not yet penetrating down to earth where I stand. I watch the sun move slowly down the tree trunks. At this hour the sun’s travels are visible, though once the light reaches me on the ground, I lose much of that sense of how quickly it traverses across the sky. I must hurry. The chickens are waiting and I am already late. Spring is slow to arrive this year. It’s still too early to work the fields. The grass isn’t turning green yet either, despite Sunday’s brief rain shower. Robins have arrived in force, and the sky is filling with raptors migrating north again. 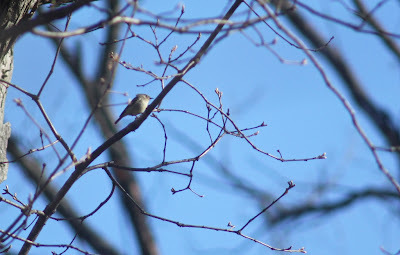 With the coming of a warming climate, I have gotten used to early springs and leaves opening before the warblers arrive. This year seems more like a pre-warming era normal spring, though of course that could change quickly. It’s rather nice to see the year ease into spring for once, instead of exploding into the season. And I can’t help but wonder what this weather will mean for the seasons ahead. The seasons are so unpredictable compared to how they were just 20-30 years ago, that a normal spring now seems abnormal. I try not to think too far ahead, but I’m not very good at that. Trying to extrapolate next month’s weather based on today’s trends is a fool’s habit I don’t seem able to break. I find I would like to see some green sign of spring somewhere. 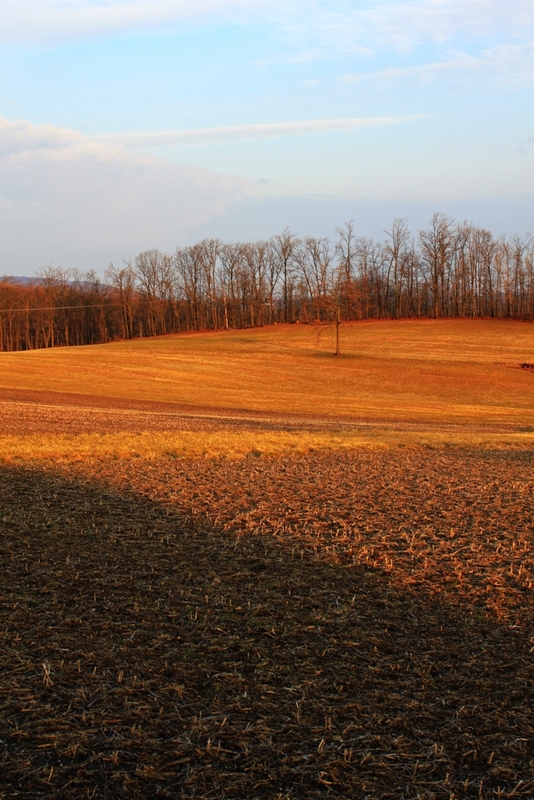 For one thing, I’m tired of photographing brown woods and fields. A new and tender green shoot pushing through the forest floor would be a nice change. I know they will come. It’s just that this interregnum between snow and spring growth is taking a long time this year.